Are you looking to update your garden fence soon? 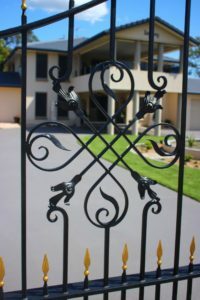 From bold contemporary fences to elegant, classic wrought iron garden fencing, decorative garden fencing can have a dramatic impact on your home’s aesthetic appeal. Fences do more than simply secure the space and mark boundaries of ownership. They add to the character of your home. But how do you know which garden fence design is right for your house? Ideally, your chosen fence should be sturdy, weatherproof and resilient, as well as provide a unique and beautiful aesthetic that complements your home’s design. Wrought iron is a fantastic option since it’s a malleable metal. This means it can be crafted into a custom design to showcase your unique personal style. Here are seven wrought iron garden fence ideas that are sure to enchant and inspire you. This garden fence uses a stunning Art Deco-inspired semicircular pattern, Baroque florals and leafy concept to create an elegant yet contemporary result that blends seamlessly with the natural surrounds. Each leaf point is dipped in gold for a luxurious finish. With its clean, contemporary lines and intricate floral design, this white brick and wrought iron garden fence looks both ultra-modern and elegant. The tops of the fence are capped with sandstone-coloured material to mirror the accents on the house. 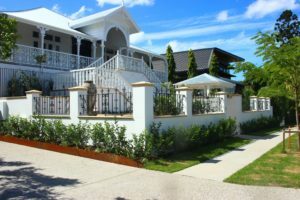 The floral design is crafted of high-quality wrought iron for durability and to match the white bannisters on the Queenslander-style verandah. This black garden fence exudes a classic Victorian feel. 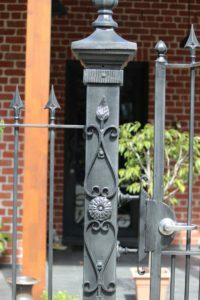 The wrought iron has been artfully sculpted into a delicate leaf and flower design, which was soldered onto the main fence. The stunning iron posts, carved into a sharp yet stylish arrow style, pair perfectly with the rich red brick of the home. 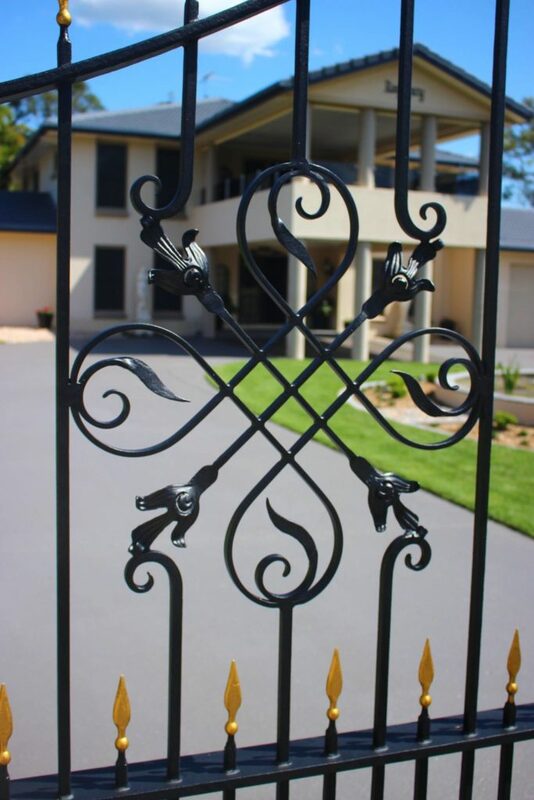 This beautiful fence features twists and spirals in polished black wrought iron. Inside the railing, the polished wrought iron features a subtle twist, while the outer parts of the railing are designed in a series of flowing, interlinking spirals. This flowing wrought iron contrasts beautifully with the structured lines of the red brick. This gorgeous and unique garden gate takes inspiration from a pecan nut tree, with beautiful polished pecan nuts and leaves threading from a sturdy trunk in the centre of the gate. 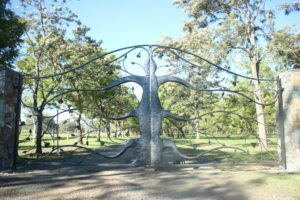 The wrought iron has been textured to give a realistic impression of a tree. No matter the style of your home, there is a decorative garden fence design to suit. Updating your garden fence with a stylish design is an excellent way to improve the appearance of your home at an affordable cost. Before you start, it’s important to take the time to consider how you would like your garden fence or gate to look, and how its aesthetic will complement the rest of your home’s design. 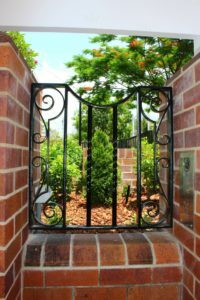 If you are looking to create an Art Deco, Victorian, contemporary or nature-themed design fence, wrought iron is the ideal material. Wrought iron fences are ultra versatile, sturdy and customisable, making them the perfect choice to create unique and stylish garden fencing that will make your neighbours envious. 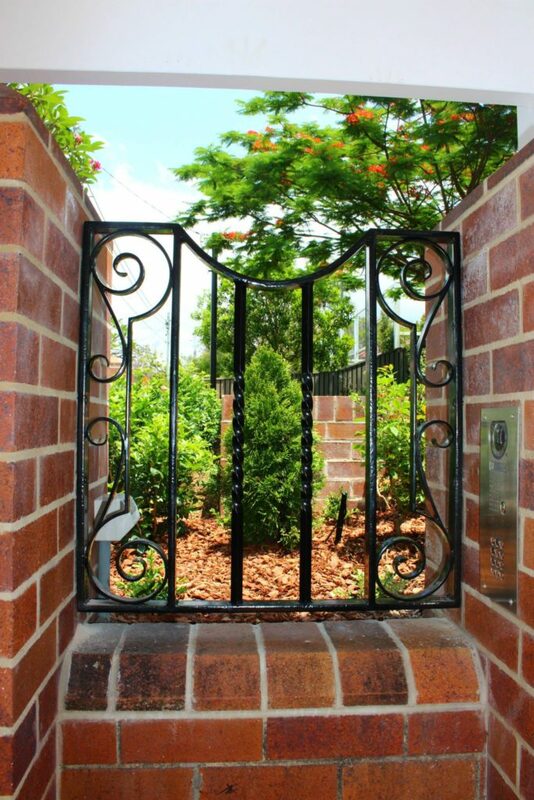 The team at Dean Wilson Iron has expertise in all types of wrought iron garden fencing design and installation. Check out the online gallery for inspiration, or talk to a consultant about your fencing vision.